By David Zinczenko, Eat This, Not That! At Eat This, Not That!, they spent a lot of time unmasking health impostors. And the truth is, the superpowers of kale, have been highly exaggerated. Sure, it’s good for you, but the ranking of kale as our greatest green is just one of many word-of-mouth myths that drive our nutritional decision-making, often in the wrong direction. Much of what we believe about food is really just hearsay, a game of nutritional telephone handed down from science journals to newspapers to television to your Aunt Phoebe to your mom and then to you, with marketers confusing the message in between. Learn how to separate fact from fiction and you might finally shed the habits that are silently sabotaging your chances of losing weight. But I must warn you: The truth can hurt. NUTRITION MYTH #1: Kale is our healthiest green. A 2014 study at William Patterson University ranked fruits and vegetables by their nutrient density, based on their levels of 17 different nutrients that have been linked to improved cardiovascular health. Not surprisingly, the top 16 were all leafy greens, which pack the most nutrition per calorie. (Coming in at #17 was red bell peppers.) But kale didn’t even make the top 10. In fact, simple spinach and even Romaine lettuce beat the alleged supergreen, as did parsley and chives. Even stuff you normally throw away—the greens atop beets—pack more nutrition. 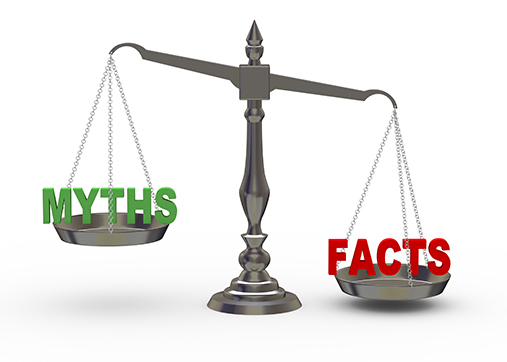 NUTRITION MYTH #2: High Fructose Corn Syrup is worse than table sugar. Sugar is the master of disguise. Maltodextrin, brown rice syrup, dextrose, sucrose—it’s got more alter egos than the Avengers. But it’s most well-known costume is High Fructose Corn Syrup. Whether HFCS is worse than plain ol’ table sugar has long been a contentious issue. Here’s what you need to know: In a 2014 review of five studies comparing the effects of sugar and HFCS, there was no difference found in changes in blood glucose levels, lipid levels, or appetite between table sugar consumption and HFCS consumption. In other words, your body can’t tell one from the other—they’re both just sugar. HFCS’s real sin is that it’s super cheap, and as a result, it’s added to everything from cereal to ketchup to salad dressing. Is it a good idea to minimize the HFCS in your diet? Absolutely. It’s best to cut out all unnecessary sugars. But HFCS’s role as nutritional enemy #1 has been exaggerated. NUTRITION MYTH #3: Diet sodas help keep you slim. The obesity-research community is becoming increasingly aware that the artificial sweeteners used in diet soda—aspartame and sucralose, for instance—lead to hard-to-control food urges later in the day. One Purdue study discovered that rats took in more calories if they’d been fed artificial sweeteners prior to mealtime, and a University of Texas study found that people who consume just three diet sodas per week were more than 40 percent more likely to be obese. Try weaning yourself off by switching to carbonated water and flavoring with lemon, cucumber, and fresh herbs. A study in the American Journal of Public Health found thatmore obese adults drink diet soda than healthy-weight adults and that, among the overweight and obese adults studied, those who drank diet soda ate more calories than those who consumed sweetened/regular soda. Researchers have also linked regular diet soda consumption with decreased response to artificial sweeteners and a decreased link between sweet tastes and energy value, meaning their bodies may grow to disassociate sweetness with satiety cues, making it easier to overeat and, therefore, gain weight. Diet and regular drinkers alike, it’s finally time to kick the habit! NUTRITION MYTH #4: Yogurt is good for the bacteria in your belly. Avoid the sugar-packed yogurts in the dairy aisle with our guide to the Best & Worst Yogurts (by type). NUTRITION MYTH #5: Foods labeled “natural” are healthier. The FDA makes no serious effort to control the use of the word “natural” on nutrition labels. Case in point: 7UP boasts that it’s made with “100% Natural Flavors” when, in fact, the soda is sweetened with a decidedly un-natural dose of high fructose corn syrup. “Corn” is natural, but “high fructose corn syrup” is produced using a centrifuge and a series of chemical reactions. Other “natural” abusers include Natural Cheetos, which are made with maltodextrin and disodium phosphate, and “natural advantage” Post Raisin Bran, which bathes its raisins in both sugar and corn syrup. The worst part is, you’re likely paying a premium price for common junk food. A recent study just revealed that many foods labeled “natural” actually use GMOs. NUTRITION MYTH #6: Dark Chocolate is good for you. It would be great if all you had to do to eat healthy was look for chocolate bars that were darker than Kristen Stewart’s mascara. Unfortunately, the secret to unlocking the health benefits of chocolate are a bit more complicated than that. Plenty of studies have shown that polyphenols—nutrients found in darkly colored plant foods like chocolate—can do everything from lowering blood pressure to raising our ability to burn fat. A 2013 study in the journal Diabetic Medicineeven found that eating dark chocolate lessened the effects of high blood sugar in diabetic patients. Unfortunately, the more chocolate is processed, the more of the polyphenols are lost. Creating “Dutch” chocolate, in which an alkalizing agent is added to the cocoa to reduce acidity, destroys up to 77 percent of the nutrients in the cocoa. To get the health benefits that have been touted since the time of Montezeuma, look for a dark chocolate that says 70% cacao (or higher) on the label. The rest? It’s just candy. NUTRITION MYTH #7: Comfort food chases away the blues. NUTRITION MYTH #8: Peanut butter is a health food. We’re not trying to scare you away from all packaged food. Keep our guide to the Purest Packaged Foods with you when you’re buying (and, yes, we included a peanut butter). NUTRITION MYTH #9: “Multi-grain” and “wheat” breads are better than white bread. NUTRITION MYTH #10: Nutrition bars are actually nutritious. Could Charging Your Phone at Night Make You Gain Weight?